This new post is about users who would like to update to the newest jdk, without having to waste time or hard disk space, by setting up from scratch JDeveloper 11g, each time a new jdk is available. Moreover, people who still use older versions of the database such as 9, may also find handy the jdbc connection localization properties hint which follows. If you 'd like to jump to it at once, please search for connecting to Oracle. A full sample of jdev.conf file is presented as a reference for your convenience. So let's get started! @REM This script is used to setup the needed environment to be able to start Weblogic Server in this domain. @REM WL_HOME - The BEA home directory of your WebLogic installation. @REM this script to switch between Sun or BEA or just have the default be set. @REM Server. 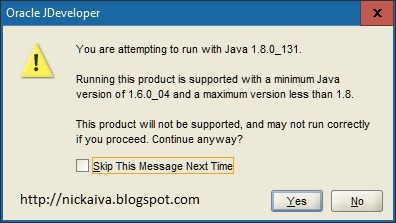 Depends directly on which JAVA_VM value is set by default or by the environment. @REM PRODUCTION_MODE - The variable that determines whether Weblogic Server is started in production mode. @REM the server to start in production mode. @REM SERVER_NAME - Name of the weblogic server. @REM For additional information, refer to "Managing Server Startup and Shutdown for Oracle WebLogic Server"
echo variable to point to the root directory of your Java installation. Although the paths are from a win7 machine, I think one can get the general idea in order to proceed. For unix or linux users, one can find help here. Thus, one can avoid the risk of losing one's application or database server connections imposed by setting up JDev from scratch and migrating. Finally, I don't know, does Oracle support officially certify jdev to work right, after a user has altered the default jdev jdk? That's why keeping the old default jdk entries as comments, is safer; in case the built in 32 bit jdk needs to be used once more. So remember before you start swearing at me, that you were warned! # Copyright 2000-2008 Oracle Corporation. # Replace heavyweight AWT controls with lightweight implementations. # Don't swap the entire JDev process out of memory when minimizing the main window. # multiple monitor setups and/or Windows 7. # Automatically dump heap on OutOfMemoryError. # any tools that can import this format. Examples are jhat, NetBeans and YourKit. # working directory of the VM. # dialog for a web service. # web service client as well. # setting it to 'true' will bring those options in JDev WS policy configuration. # Prevents the desktop hanging when debugging JDev on Linux and hitting a breakpoint with a popup open. # projects add this flag to the java options for the process to be debugged. What worries me most, is when each newer version of the I.D.E. 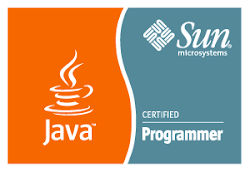 or Sun jdk becomes available, if one is forced to setup from scratch, might not remember all the necessary steps to edit properly the new configuration files and continue with the current project. So backing up the jdev configuration files sounds like a good, proactive idea!